Monique Cockerill poses with the giant topiary stiletto shoe in St Christopher’s Place, London. 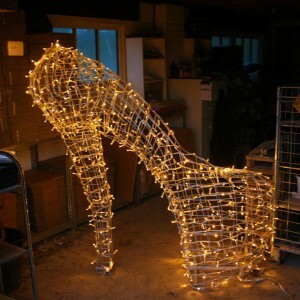 The Lady Gaga shoe was commissioned to launch a week-long event of floral and fashion themed festivities. This two metre high stiletto was positioned in St Christopher’s Place in London, just a stone’s throw away from the hustle and bustle of Oxford Street. The design was based on a pair of similarly formed denim stiletto shoes purchased by Lady Gaga from Lungta de Fancy in St Christopher’s Place. The local traders wanted to commemorate the celebrity visit, and what better way than through the art of topiary! St Christopher’s Place wanted the shoe covered in living plants and we used fast-growing Star jasmine (Trachelospermum jasminoides), which offers the added bonus of seasonal, fragrant white flowers. It took just a week to create this piece from scratch. The success of the project inspired St Christopher’s Place to commission another shoe from Agrumi, but this time covered in twinkly LED lights.